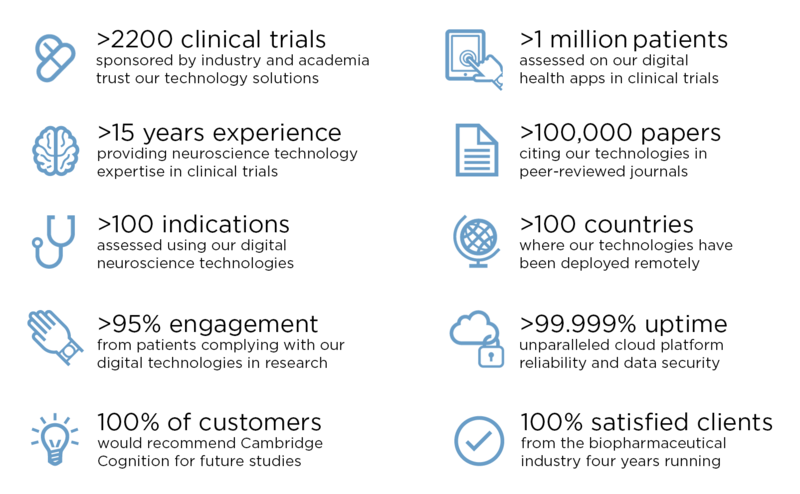 Cambridge Cognition is a leading neuroscience technology company optimising the assessment of cognition for better brain health with scientifically validated digital health solutions. Our software enables gold standard research and efficient clinical trials, accelerating safe and effective treatment development and helping to improve patient outcomes in conditions affecting brain health. For over 30 years, our technology has been at the forefront of scientific discovery, delivering value to research institutions, healthcare providers and pharmaceutical and biotechnology companies worldwide. From digital health tools to mobile applications for drug development, we provide best in class, interactive and innovative digital cognitive assessment technologies that capture meaningful, reliable data anytime, anywhere. Optimise patient selection, clinical trial design and eCOA signal detection. Conduct patient-centric virtual clinical trials and identify digital biomarkers. Assess all areas of cognition with the world’s most sensitive cognitive tests.